My tennis journey began later than most around the age of 11. I committed a lot of time to practice and would play with anyone, spending most of my weekends at the club playing practice sets or away at tournaments competing, I always loved competing and still do. Recently I have started playing for Yorkshire over 35 men’s team as well as representing Thongsbridge in the National Premier Winter League and Aegon Men’s Team Tennis and am really enjoying training again. The highlight of my career has to be playing doubles with Martina Hingis against Thongsbridge’s Nick Fitzpatrick and Former British number one Anne Keothavong in front of 2000 people at the Northern International held at Thongsbridge. I began tennis coaching by assisting other coaches before starting my first LTA Coaching Qualification in 2000 and from there I continued to work up to level 4. Over the years I have helped the club evolve and been heavily involved with developing numerous county, national and international level players. I have also captained a number of junior Yorkshire teams from under 10 girls up to under 14 boys winning National finals 3 times and earning runners up medals twice. In 2010, to aid the physical development of our tennis players, I decided to begin training as a strength and conditioning coach, completing an MSc in Strength and Conditioning at the university of Bolton and earning accreditation with the UK strength and conditioning association. The S&C programme has now grown, with 3 S&C coaches, and is an essential part of player development at Thongsbridge. To continue my development I have recently completed a course with the International Tennis Performance Association (ITPA) to become a Certified Tennis Performance Specialist, as continual personal development is very important to me. More recently, to bring the tennis and fitness sections of the club together, the S&C team now manage the fitness side ensuring the members receive a high quality service that meets their individual goals from fitness classes to personal training. 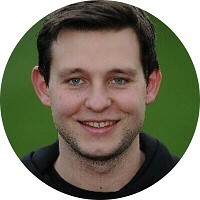 I started my working career in sport at a championship football academy in 2010, responsible for delivering movement based sessions and gym technique for youth athletes. In 2012 I moved to professional rugby league, working with a super league first team and also within the academy. This role included working with international level athletes, delivering gym programmes, recovery sessions, conditioning and monitoring. In 2015 I joined Thongsbridge Tennis & Fitness Club as a Strength and Conditioning coach, coinciding with the opening of The Powerhouse. 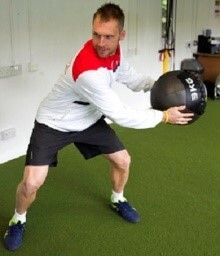 Since then I have worked within the team to build and develop the Strength and Conditioning programme. In 2016, I joined the gym team as an instructor and personal trainer. I pride myself on delivering a high level and professional service to all clients. I am a Strength and Conditioning coach and Personal Trainer at Thongsbridge Tennis & Fitness Club. My interests include socialising, playing football and of course training. My professional interests lie in improving physical performance and health. This started in 2011 when I began studying Sports science at Huddersfield University. I went on to complete my Masters at Sheffield Hallam University. Over the years I have been and am still currently involved in various roles with elite sport such as rugby football league and professional football. I am currently holding a role as strength & conditioning coach for England touch rugby. I am a very approachable and friendly sort of guy. I am an enthusiastic trainer who loves doing the job that I do. 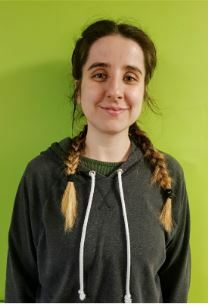 I have two main roles at Thongsbridge, the first includes the day to day running of the fitness suite, where you will often find me training members to reach their goals, and in addition to this I teach a few of the studio classes and also the very successful Boot Camps which have achieved some excellent results for members. My second role is being an active member of the Sports conditioning team. I coach both junior and adult tennis players to improve their performance on court and also reduce the risk of injuries. I am a fitness instructor and have also been involved in personal training since the age of 17. Although my attention has recently been focused on fitness and coaching I actually used to play tennis. I have been playing tennis at Thongsbridge Tennis & Fitness Club since the age of 5 and played at County level for Yorkshire. Not competing in tennis anymore I have changed my focus more towards the sport of powerlifting in which I competed and represented the University team when I spent 3 years at Sheffield Hallam. I am passionate about my work and in helping clients reach their goals. I take my job very seriously and aim to deliver excellent PT sessions whilst at the same time being able to have a laugh with my clients. Each session is personalised to clients’ needs. I have developed an expertise in individual coaching for body composition results where I provide fitness goals that help deliver results. I am also studying towards a diploma in nutrition coaching. This diploma is a 1-year online course dedicated to creating the best individual coaches. I began my fitness journey in my final year of university mainly as a way to cope with dissertation stress! Prior to that I played basketball at school but never took exercise too seriously. What started as a way to decompress quickly became a habit and now I can’t imagine a time where training wasn’t part of my routine. Whether you are a total beginner or you have a solid foundation, my goal is to help you find what works for you and helps you remain consistent. Come and chat with me on the gym floor! I can help you achieve what you previously thought impossible. 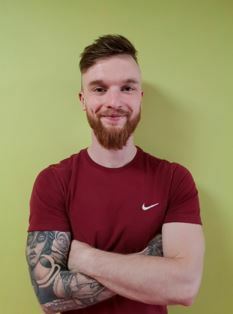 After three years of training myself I decided to pursue my level 3 in personal training and I am looking forward to continuing to develop within the fitness industry. I was never a natural athlete or someone who could imagine spending hours at the gym, but I’ve discovered that all it takes to achieve your goals is to change your mindset and get started! I started my education at Woodhouse Primary School going on to Rastrick High School, followed by Rastrick sixth form college. I then went to university in Bolton, Lancashire where I studied Sports Rehabilitation. From this not only did I gain a qualification but also gathered a lot of experience in the field of sports massage. During my time at university I was given the opportunity to visit different sporting venues whilst attending work placement; venues such as Wigan Warriors RLFC, Leigh Centurions RLFC, Rochdale FC and Stoke City FC. These placements allowed me to receive first-hand experience working with both professional and international athletes. Since graduating I started my working life by offering a mobile massage service, which has helped me build up a good clientele base. Now that my business has grown, I am now in a position to expand and have recently agreed to join the team at Thongsbridge Tennis Club. With over 6 years experience I feel I have a lot to offer the members in the way of recovery treatments and sports massage. Outside the world of sports massage I am a massive fan of Huddersfield Town. I have held a season ticket for over 15 years. I have a love of music and in my spare time I enjoy playing my guitar.